Growing up I helped my mom a lot in the garden. Although, as a kid, that consisted mostly of weeding! I found my old photo albums and have been working on getting the pics of my greenhouse, containers and flower beds scanned and the captions written.. 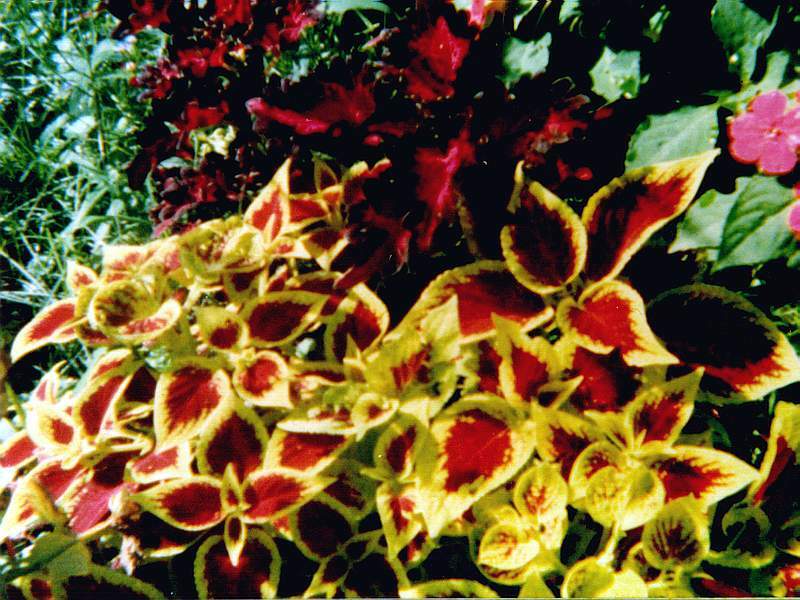 The one I have here is a shot of some Coleus that I planted in a shady spot next to my front steps. I took advantage of the 'micro-climates' of my yard to be able to plant a wide variety of plants in a very small yard. Hey, this is less work! I was in my thirties when I read of a method of gardening that had been around for years. I started seeking more information on what was referred to as deep bed gardening, and in the process learned about square foot gardening. With the combination of these two methods, combined with my own imagination, I came up with a way of gardening that I thought to be just about perfect. There are tons of sites that cover square foot gardening, definitely worth your checking out if you love gardening but hate the work part. Now I can spend more time relaxing and less time working and still get the benefits of home grown munchies and flowers. Well, not exactly now. My current location doesn't allow me to have garden space. But I will again one day. Space is Limited this year - But that didn't stop me completely! Here's a pic of the mobile container garden that we had here on the deck the summer of 2002. There are six Better Boy Hybrid Indeterminates on the cart and one lonely Cayenne Pepper plant on the deck on the far side, hiding in the shadows. The cart allows us to pull the plants into the house during the fall to protect them from the frost and extend the growing season for several weeks. Really works out nice. This pic was taken in late June. By mid July and the plants had more than doubled in size and we added cages to extend the height. Several were taller than me! In early September the plants are still doing well, fruit ripening, fruit still developing and more flowers blooming. In 2003 we again had the cart out on the deck. We had a bit more variety in tomato plants. Early Girl, Big Beef, Better Boy, Miracle Sweet, Classica Hybrid and Fabulous Hybrid... And that pepper that was tucked way in back the year before... spent the winter here in the office with me and went back out side.. bloomed like crazy and gave dad lots of cayenne peppers to dry! By 2004 the trees were shading the deck REALLY well.. good for us.. bad for the tomato cart.. So no cart was set up. And now, 2005. The deck is still super shady... no plans on whether or not to set up the cart so that we can roll it into the garage in the fall.